A friend of mine was recently pronounced head chef of The Coach and Horses. Having never tasted his food before as he used to work outside of London, a big group of us decided to go down one Thursday evening and try it out. His name? Harry McKenzie. Remember that one. I have read some great reviews and fellow blogger Neil Davey (The Lambshank Redemption) hails it as his favourite pub in London. I can see why. 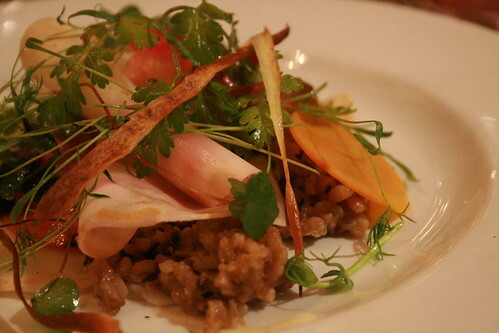 The menu is not for the faint hearted (or the veggie). However, knowing that 2 of our group are vegan, Harry concocted an extra special 3 course meal consisting of Wild Herbs and Sea Vegetable Tempura to start, Celeriac, Candied Beetroot and Squash Lasagne with foraged Mushroom Risotto, Wild Chervil and Cobnuts for main and Chocolate Mousse, Apple Sorbet and Herb Crisps for pudding! The Coach and Horses homemade Scotch Egg has been the talk of the town for a while so I decided to order it as my starter. It is on the bar menu but I was allowed to substitute this. My boyfriend and I generally share everything we get so he got the Potted Cornish Mackerel with Toast and we swapped plates half way through. The Scotch Egg came and it was huge. Inside was a Duck Egg with a runny and rich yolk. You may have read my post recently after I had baked a cake with Duck Eggs. I’m becoming quite a fan! 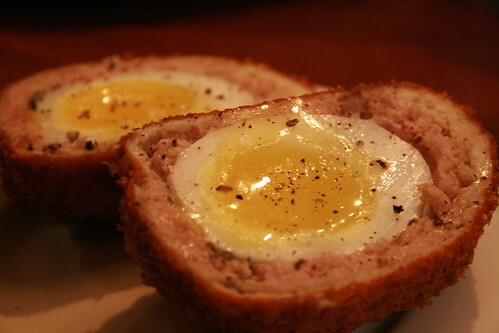 The Sausage meat was fatty and hearty, JUST what you want from a Scotch Egg. 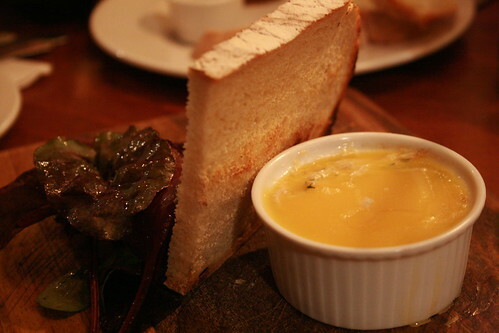 The Markerel was rich and creamy with a delightful fatty layer on the top. It was presented very nicely on a wooden board. 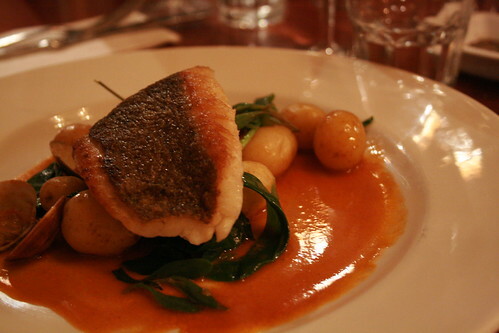 For main I ordered Pork Belly with Mash, Roast Beetroot, Spinach and Ceps and Jack had Cornish Brill with Clams, Sea Vegetables, Baby New Potatoes and Bisque. I told him that the meat options would be better because the menu is mostly predominantly meat plus Harry is a meat fanatic (or at least that’s what I gather from my conversations with him). 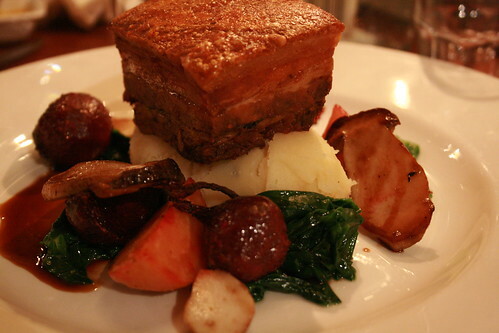 My pork was definitely the best option but maybe i’m biased because I Pork Belly is always one of my favourite dishes. I don’t think I’ve ever had Roasted Beets before but they were absolutely delicious with a hint of sweetness. 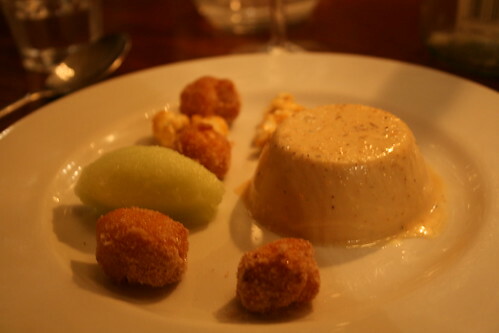 For pudding, I couldn’t resist trying the Popcorn Panna Cotta with Cinnamon Doughnuts, Toffee Popcorn and Apple Sorbet. One word – yum! The apple sorbet is one of the best I have ever tasted. It was bright green, which made it look super fresh and was tangy and sweet at the same time. Harry shared the recipe with me after our meal and I’ll no doubt be making it soon. Watch this space. Popcorn is popping (excuse the pun) up everywhere at the moment. There’s something comforting about it – probably because it reminds me of when I was a little girl being treated by my parents at the cinema. That was (and probably still is) one of the best parts of a cinema trip wasn’t it?! The pub wasn’t all that busy on a Thursday evening. There aren’t a large number of tables but we took up most of the dining space! I heard that there is a room off the back with a terrace but I assume that is only used in the summer. I clocked that they do Sunday roasts just before I left and have already penciled a date in the diary to return!